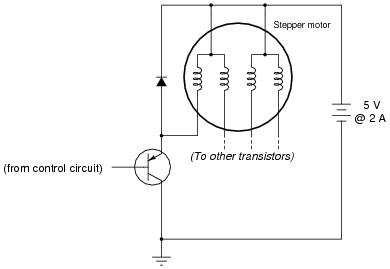 Each motor coil draws a relatively heavy current when energized, necessitating transistors to ïnterpose" between the microcontroller outputs and the motor coils. 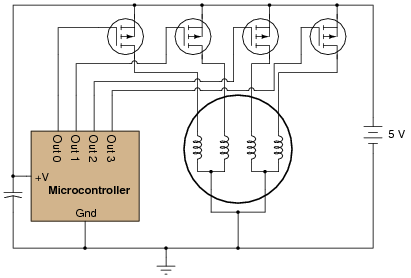 Each stepper motor coil becomes energized when the respective microcontroller output goes to a "low" (Ground potential) state. Follow-up question: if the resistors had to be left in place, would the modified (MOSFET instead of BJT) circuit still function properly? 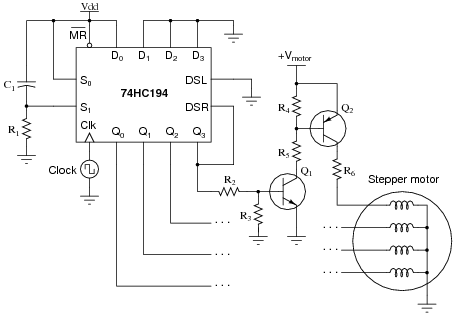 No commutating diodes have been shown in this circuit, for simplicity's sake. If any students ask about this, commend them for noticing! The diode is installed, of course, to prevent high-voltage surges from destroying the output transistor each time it turns off. 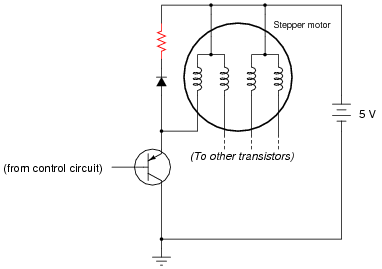 However, this causes a different problem: with the free-wheeling diodes in place, the magnetic field formed in each coil takes longer to "decay" when its respective transistor turns off. This delay in time imposes a maximum rotational speed on the stepper motor, because the motor will not move to the next step until the magnetic field(s) from the previous step have dissipated. 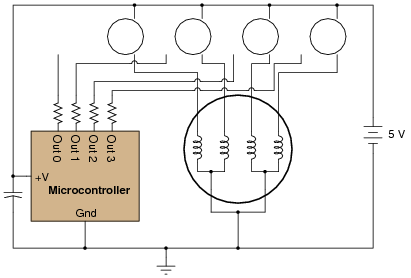 What modification may be made to this circuit to allow the transistors to switch faster, driving the stepper motor at a higher rotational speed? Explain in detail why your solution will work. I won't explain exactly why this solution works, but I'll let Michael Faraday give you a mathematical "hint:"
Follow-up question: what factors determine the resistance value of the new resistor shown in the diagram? Challenge question: determine how to calculate the magnitude of the voltage ßpike" seen at the transistor's collector terminal given a certain resistance value, diode specifications, and full-load motor coil current. Ask your students to describe the rate-of-change of magnetic flux in each coil upon transistor turn-off, with no commutating diodes in place (assuming the transistor could withstand the transient voltages produced by the inductor). It should become clear to your students that the inclusion of diodes to prevent the high-voltage ßpikes" literally creates the problem of magnetic field decay time. 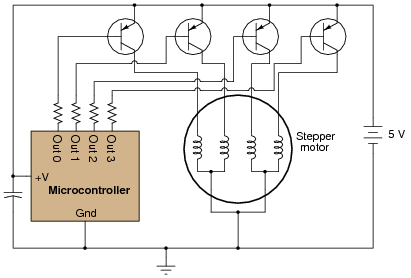 Stepper motors are often used in low-power servomechanisms such as those found in small robots, computer printers, and other precision electro-mechanical machines. Explain why this type of electric motor is more popular than permanent-magnet DC motors or other motor types. Hint: the answer is closely related to the name of the motor itself (ßtepper"). Unlike other motor types, stepper motors move in discrete ßteps," lending themselves very well to digital modes of position control. Make sure students get a chance to feel the motion of a stepper motor in their own hands when you discuss stepper motors in class. If you don't happen to have any stepper motors available, they are easily obtained by salvaging parts from worn-out computer printers!